Congrats to the Pu’uwai Pink Paddlers! Some details on the latest voyage from Maui to Lana’i and back! Well done gang! Click here to see some photos and videos. 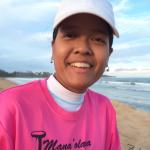 The Mission of Pink Paddlers is to cultivate hope, health, fitness, and fun for cancer survivors By getting them up, out and about, and embracing the active Kauai lifestyle. Utilizing traditional Hawaiian outrigger canoes, and a strong cadre of paddling supporters, we encourage physical exercise to build strength, confidence, and friendship. Our goal is to prove by example, that exercise can make a difference and to demonstrate that people living with this disease can lead full and active lives. Our ultimate objective is to expand Hawaiian Outrigger Paddling To all Kauai resident and visiting cancer survivors and eventually expand our program throughout all canoe clubs nationwide. To become part of Pu’uwai’s Think Pink program click this link and follow the instructions for adult paddlers.